Spent residue and oxidized gel coat is a buffing pad�s worst nightmare. If you neglect to clean your pads when you�re finished compounding or polishing for the day, the chemicals in the polish combined with the oxidized gel coat will slowly eat away at the pad, affecting its integrity. When you go to use that pad in the future, there is a possibility it will fail as you�re using it, putting you at risk of running the buffer directly into the gel coat. With a few quick sprays, Marine 31 Spray Polishing Pad Cleaner removes spent residue and oxidized gel coat, leaving your pads looking and feeling new! Marine 31 Spray Polishing Pad Cleaner is comprised of specialized cleaners that are designed to break up and dissolve compound, polish and wax residue, among the other contaminants that plague a buffing pad after polishing a boat. 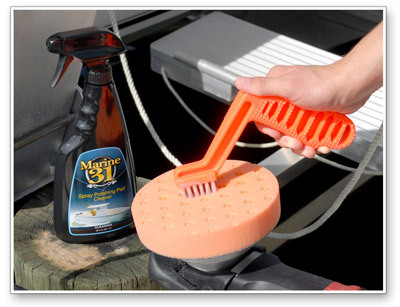 Marine 31 Spray Polishing Pad Cleaner rinses freely so no unwanted residue is left in the pad. 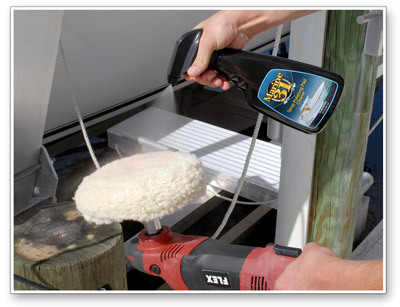 Marine 31 Spray Polishing Pad Cleaner can be used on all buffing pad types including foam, wool and microfiber. For best results, clean pads immediately after each use. Spray a liberal amount of cleaner directly onto pad and allow to dwell for 30 seconds. Agitate pad using appropriate wool or foam pad conditioning brush. Rinse thoroughly with a warm stream of water and allow pad to air-dry with the backing material facing up.